Buying jewelry for my 13-year old granddaughter was harder than I expected! But then I stumbled onto Genuine Bijoux and found the perfect gift: a blue Murano glass heart necklace with matching earrings. Not only is it something she adores and actually wears, it didn’t break my piggy bank. Wow! This is the first time I have brought jewelry online and I was really nervous about it. Well, not anymore. Genuine Bijoux, you were fantastic, and the natural brass and red Swarovski crystal is the best jewelry purchase I’ve made in years. I absolutely love it. And you have a customer for life! I just made my first purchase from Genuine Bijoux and wanted to send a small thank you. 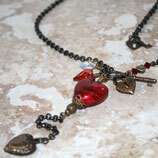 The solid brass necklace with the red gold-foil Murano heart really is a spectacular specimen and worth every penny. It looks even better on me than it did in those photos on your website. Thank you! I have an upcoming dinner engagement for which I have the perfect dress. The problem has been that I couldn’t find the perfect earrings. That was until I saw your royal earrings with sterling silver hearts. Not only is this perfect for the dress, it’s unlike anything I’ve seen before. I come across plenty of online jewelry shops that promise unique pieces yet few have delivered on the promise the way you did. 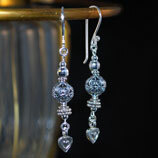 The heart and key earrings with Swarovski crystals are gorgeous and unlike anything available in my local area. This was the best purchase I’ve made in quite some time. 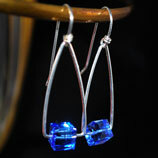 I love going out in the jewelry that I purchased through Genuine Bijoux. You want to be different and stylish without standing out too much. It’s not easy to do. 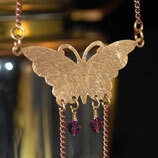 But the solid brass butterfly necklace with the Murano heart pendant is a true delight. It really stands out without being obnoxious. I was searching for the perfect gift for my young niece and I was about to give up when I found the brass butterfly necklace with Swarovski amethyst crystals at Genuine Bijoux. This piece is so spectacular that I ordered a second one just for myself. Anyway, she really loves it and it didn’t cost me a fortune. Thanks. Shopping for something “different” sounds good until you actually get out there and try to do it. Most of the jewelry today is cookie cutter and uninspired. 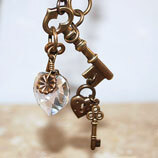 So when I saw your handmade Hearts n’ Keys necklace with Swarovski crystals, I knew I was looking at something special. It looks just as good in person. About a year ago, I found brass circle ladder earrings at a flea market that where to die for. I had to have them until I saw the price tag and realized I couldn’t. 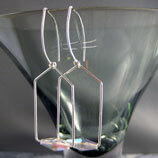 A week ago, I finally found earrings like them on your site. Here’s the kicker: Not only are they better looking, they’re about one-third as expensive! With all the daughters, sisters and nieces in my family, Christmas shopping can be a nightmare. But this year things were a lot easier. Through Genuine Bijoux, I was able to buy them all something distinct and wonderful, and I was able to do it on a relatively small budget. Thank you. As any mom can attest, buying jewelry for young girls is tough, especially on a limited budget. The jewelry sold here has been a blessing. My 11-year old daughter wears her purple-colored Murano glass heart necklace to school every day, and it didn’t cost us a fortune. We’ll be back again. I just wanted to send you a heartfelt thank you. For the longest time, I thought I’d never find the perfect jewelry for my wedding. But you not only helped me find it, you sold it to me at an amazing price. I’ll never forget the effort, and you have a customer for life. I’ve made several purchases through Genuine Bijoux now and I just wanted to take a moment to say thank you. Your customer service and attention to detail sets you apart. It really does. Your willingness to work with me and the careful touches you put on the packaging were unlike anything I’ve experienced before. I placed some big demands on Genuine Bijoux. I needed a certain piece a certain way and I needed it on a deadline. Many companies may have balked but not you guys. Not only did you accommodate me, you went out of your way for me. I really appreciate the effort. Over the past year, I’ve made a number of purchases through your site for myself and as gifts. And every time I have, you have delivered. I just wanted to say thank you. I wanted Genuine Bijoux to be my little secret but I had to tell my friends and family about you. Thank you.